At Wit's End: Continue With the Crusade? Okay, after a couple of successful mailbags, no one has found the time to send in any more questions. This is fine--if you guys don't want a mailbag, I can totally understand it. The only problem is that because I'm juggling so many other projects right now, it's very tough to do four full blog posts per week and the links. My thought is that it might be easier if I could write some kind of short, weekly feature on Tuesdays, with the "regular posts" going up on Monday, Wednesday, and Thursday, and the links on Friday. The only problem is, the only regular posts I have thought of so far are pretty research-intensive. So, I ask you, dear readers, what kind of semi-quick regular feature do you want to see on Tuesdays? It could be about the creative process, or more of a niche kind of thing about wine or sports or entertainment or whatever. Let me know what you would find useful and interesting so that I can provide some value. If I don't hear anything back, I'll just take posts down to four per week, with Tuesday being an off-day. Let me know what you all think in the comments, or e-mail me at djssuperblog@gmail.com. D.J. Gelner is a writer, entrepreneur, and former attorney in St. Louis, Missouri. 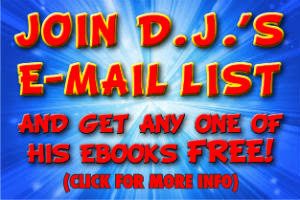 You can e-mail him at djssuperblog@gmail.com. Follow him on twitter @djgelner. Friend him on facebook here. What if We’re Asking the Wrong Question?